Jibril said that it was important to unify the country and begin a smooth transition immediately. "We're all Libyans and we're all sons of this nation," he said. "There is no need for any score settling." Jibril described rebels' entrance into Gadhafi's compound Tuesday as a significant symbolic step that "finalized" the rebels' victory, and he described Saif al-Islam Gadhafi's appearance at the Rixos Hotel as a "desperate," Hollywood-style "attempt to steal the revolution." He said a meeting of international leaders Wednesday would focus on organizing aid for Libya. The meeting will include officials from the NTC, the United States, the United Arab Emirates, Qatar, Italy, France, the United Kingdom and Turkey, he said. The aid money would go toward paying salaries for Libyans and covering medical treatment for those injured in the fighting, he said. [Updated 5:50 p.m. ET, 11:50 p.m. in Libya] CNN's Matthew Chance, who is with a group of international journalists at a Tripoli hotel held by Gadhafi loyalists, says the hotel and its perimeter are fairly calm at the moment, with only sporadic gunfire heard in the distance. Gadhafi loyalists have not allowed the journalists to leave the hotel for days. Chance, who yesterday reported that their encounters with some of the loyalist gunmen at the hotel have been tense, said that one of them gunmen today - apparently referring to the rebels' takeover of Gadhafi's compound nearby - shouted to the journalists: "Hey, are you happy now?" [Updated 5:38 p.m. ET, 11:38 p.m. in Libya] Video from the rebel stronghold of Benghazi in eastern Libya shows hundreds of people in the square, celebrating the day's developments, which includes the rebels' capture of Gadhafi's compound in Tripoli. Large numbers of people have arrived in the square in the past 20 minutes, many of them having just broken their Ramadan fast for the day, CNN's Fred Pleitgen reported from Benghazi. "For the first time, they say, they know for sure that Moammar Gadhafi is not coming back," Pleitgen said of the celebrants. "The rebels that took over this area say that they still have not secured the land to the east of it," Damon told CNN International. "It is also where they tell us there are two military compounds, and it is (Gadhafi loyalist) units from those compounds that have been launching multiple assaults on the airport, trying to take it back, the rebels say, because of its strategic location." Damon said rebels still haven't secured a highway that virtually connects the airport to Gadhafi's compound. "(Rebels) tell us that they believe it still is going to be a fairly intense fight in this (airport) area. They have gone so far as to speculate that it could possibly be the final battle that transpires between these rebel fighters and the Gadhafi loyalists," Damon said. Fighting was fierce in the airport area as recently as two hours ago. Now the fighting is less intense, with sporadic gunfire and occasional explosions heard in the distance. [Updated 4:01 p.m. ET, 10:01 p.m. in Libya] Mahmoud Jibril, chairman of the NTC executive board, told the young people of Libya in a news conference: "This is your revolution." "I would like to assure to them that this is your revolution and will always be as such," he said. He referred to those leading the charge as "the pure young people who brought us our dignity back." Jibril called Gadhafi's son's appearance in Tripoli Monday night a "Hollywood" stunt aimed to "steal the revolution from the noble people" leading it. Jibril thanked all of the nations that have helped aid the country start moving towards a transition to freedom. [Updated 3:47 p.m. ET, 9:47 p.m. in Libya] CNN's White House Correspondent Dan Lothian reports: As CNN and other networks were airing live reports from Libya, an administration official said that President Barack Obama's national security team was watching the dramatic scenes from Libya unfolding on TV. When asked about whether they were watching, the official answered "absolutely." @mchancecnn: "It's been very quiet for the past hour, probably because it's iftar. #Rixos4 #Libya #Rixos #cnn"
Chance was referring to the meal eaten when Muslims break fast after sundown during Ramadan. That's been a fairly normal trend over the past few days. CNN's Dan Gilgoff takes a look on the Belief Blog at whether Ramadan is playing a factor in the rebel fight in Libya. @mchancecnn: "Former U.S. Congressman Fauntroy is amongst those holed up in #Rixos." @mchancecnn: "Fauntroy was on a peace mission." @mchancecnn: "Hotel still under #Gadhafi control, even as celebrations spread nearby. #Rixos4 #Libya #Rixos"
[Updated 3:01 p.m. ET, 9:01 p.m. in Libya] Mahmoud Shammam, minister of information for the National Transitional Council, told CNN that major gains were made by the rebel forces today but there was still more to be done. "We have to make sure we control every piece of Libya," he said. He added rebels and citizens alike are looking forward to a new country. "We are hungry for freedom ... we are hungry for a state of law," he said. When asked if he is worried about different factions within the rebel fighters would make a united Libya difficult, Shammam said: "This [will be] a very difficult task, I'm not painting a rosy picture." He added faction wouldn't be an issue "If we stood as one front, if nobody is trying to play the political game"
Shammam said he country will need support from the international community when it comes to getting some guidance and advice on legal and financial issues. [Updated 2:36 p.m. ET, 8:36 p.m. in Libya] Bullets were fired into Moammar Gadhafi's compound Tuesday evening, and Libyan rebels told CNN it was coming from Gadhafi forces. CNN's Sara Sidner and her team had to evacuate the compound after bullets came shooting nearby. People began to run and flee the area. The events came hours after rebels seized control of the compound. "The headline is Gadhafi forces are now targeting ... their own compound." @sarasidnerCNN:"Inside Gadhafi compound. Rebel: 'Libya is Free'"
@sarasidnerCNN: "I am walking into Eastern Gate of Gadhafi compound for the third time today." @sarasidnerCNN: "Clearly the rebels have it. A psychological win for the rebels." @mchancecnn: "Even as compound falls to rebels, #Rixos still in #Gadhafi control. #Rixos4"
[Updated 2:01 p.m. ET, 8:01 p.m. in Libya] CNN's Sara Sidner is walking inside the Gadhafi compound passing countless numbers of rebels and civilians who are carrying guns and other items from inside. Rebels on tanks continued to fire off celebratory rounds. A group of rebels opened up a box and showed Sidner a variety of weapons taken from inside. [Updated 1:58p.m. ET, 7:58 p.m. in Libya] CNN's Matthew Chance said journalists at the hotel in Tripoli are "pretty frightened to be honest." "We're upstairs. It's very hot in the hotel. We've all got body armor on. We don't know what to expect," Chance said. "We want to get out of here. But we are unable to do that. It's almost like a situation where we feel we are being kept against our will." [Updated 1:38 p.m. ET, 7:38 p.m. in Libya] The war in Libya "is not over yet, although it's close," a senior NATO official said Tuesday. [Updated 1:34 p.m. ET, 7:34 p.m. in Libya] CNN's Sara Sidner spoke with one rebel who was inside the compound who said there was still some tea on the fire, perhaps indicating that whoever was inside left quickly when rebels stormed the area. “They left their cars, their weapons,” the rebel said. He said he saw soldiers running away. [Updated 1:28 p.m. ET, 7:28 p.m. in Libya] CNN's Matthew Chance is reporting from the Rixos Hotel and said that there had been heavy gunfire in the area. He tweeted: @mchancecnn: "Shooting around #Rixos; journalists moving upstairs to safety #Rixos4"
The journalists have been unable to leave the hotel. "The mood has turned very ugly," Chance said. [Updated 1:27 p.m. ET, 7:27 p.m. in Libya] Abdel Hakim Belhadj, the head of the Libyan rebels' forces, said he thinks there are pockets of fighting in Tripoli but said that "Gadhafi and his sons fled like rats. We haven't seen them, just traces of them." [Updated 1:19 p.m. ET, 7:19 p.m. in Libya] Rebels celebrating inside the Gadhafi compound have told journalists to “go in, show the world what we’ve done," CNN's Sara Sidner reported. "They told us this was the end," she said. "It's very rare that you see anti aircraft fire” as celebration, she said, describing the scene around her. [Updated 1:17 p.m. ET, 7:17 p.m. in Libya] The United States is working with the United Nations to release $1- to $1.5- billion in U.S.-held frozen Libyan assets, State Department spokeswoman Victorica Nuland said Tuesday. She said they want to give the money to the National Transitional Council for humanitarian purposes and to "help it establish a secure, stable government." [Updated 1:10 p.m. ET, 7:10 p.m. in Libya] Residents in Tripoli are going into the Moammar Gadhafi compound - seized by rebels - and are taking items from there, CNN's Sara Sidner reported on Tuesday. Rebels are sitting on Gadhafi regime vehicles inside the compound and firing off a large amount of shots. She said there is a large blast hole in the eastern gate. Sidner held up a uniform from the Gadhafi regime that was lying on the ground in his compound. [Updated 1:06 p.m. ET, 7:06 p.m. in Libya] Aref Ali Nayed, Libya's ambassador to the United Arab Emirates, said Tuesday the rebel entry into Moammar Gadhafi's compound in Tripoli represents "a complete victory and we thank God for that." [Updated 1:04 p.m. ET, 7:04 p.m. in Libya] CNN's Sara Sidner reports that gunfire is erupting all throughout the Gadhafi compound. She added that the celebratory gunfire is becoming dangerous because its coming from every direction. "There's [also] now smoke coming from another section of the compound," she said. Sidner said the celebration is a clear indication of the importance of the compound to the rebels. "This is a day when the rebels feel like they have made sure the world knows that Moammar Gadhafi no longer has a grip on their country … or rules Tripoli with an iron fist," Sidner said. [Updated 1:04 p.m. ET, 7:04 p.m. in Libya] A "reliable affirmative" statement from Moammar Gadhafi is needed to underscore that "the days of his leadership are over," U.S. State Department spokeswoman Victoria Nuland said. [Updated 1:01 p.m. ET, 7:01 p.m. in Libya] An Al Jazeera journalist has been wounded inside the Moammar Gadhafi compound in Tripoli, the Arabic-language TV network reported on Tuesday. Details about the nature of the injury were not immediately available. [Updated 12:58 p.m. ET, 6:58 p.m. in Libya] "There's no question that the Gadhafi regime has nearly collapsed," said State Department spokeswoman Victoria Nuland said Tuesday. [Updated 12:51 p.m. ET, 6:51 p.m. in Libya] Gunfire can still be heard and scene at Moammar Gadhafi's Bab al-Aziziya compound. Some rebels were showing off items taken from the compound, including what appeared to be a gold-plated AK-47. [Updated 12:44 p.m. ET, 6:44 p.m. in Libya] Al Arabiya is reporting that rebels are now conducting room-by-room searches in Gadhafi's residence. [Updated 12:38 p.m. ET, 6:38 p.m. in Libya] CNN's Sara Sidner, now inside Moammar Gadhafi's vast Bab al-Aziziya compound, said neither the longtime ruler nor his family members have been located by rebels. “[Rebels] have knocked down walls, they have knocked down buildings, buildings are on fire,” she said. "I see a lot of smoke coming from one of the buildings." Sidner said it looks like rebels are taking as much weaponry from the compound as they can. "I see people running out of the buildings with lots of ammunition, I see tanks," she said. "We are seeing rebels everywhere." Video from Al Jazeera shows rebels riding around on vehicles firing their weapons in the air and waving the rebel flag. "We are not hearing those huge blasts and booms that we were hearing earlier today," Sidner said. concerned about whether Gadhafi's military still has a stockpile of chemical weapons. "It's something we've been watching from the beginning of the conflict in Libya," Susan Rice said. "We have not seen immediate cause for concern, but we will keep a close eye on that throughout." [Updated 12:22 p.m. ET, 6:22 p.m. in Libya] There were still some instances of fighting in Libyan leader Moammar Gadhafi's compound Tuesday even after rebels leaving the compound were seen celebrating, rebels said. [Updated 12:17 p.m. ET, 6:17 p.m. in Libya] The situation remains fluid" in Libya and "fighting is still going on," the U.S. ambassador to the United Nations, Susan Rice, said Tuesday. [Updated 12:12 p.m. ET, 6:12 p.m. in Libya] An historic building inside Moammar Gadhafi's vast Bab al-Aziziya compound has been burned and the fighting at the compound is over, a Libyan rebel told CNN's Sara Sidner. Sky News showed video they said was from inside the compound. In the video, rebel forces surrounding the iconic sculpture of a raised fist crushing a U.S. plane in Gadhafi's compound. [Updated 12:02 p.m. ET, 6:02 p.m. in Libya] CNN's Sara Sidner said rebels told her the "fight is finished" at Gadhafi's Bab Al Aziza compound. “They could even swim in the swimming pool” Sidner said rebels told her. Rebels said the blasts being heard are celebratory. [Updated 11:58 a.m. ET, 5:58 p.m. in Libya] An Al Jazeera reporter inside Gadhafi's Bab Al Aziza reported there is no resistance anymore inside the compound. [Updated 11:45 a.m. ET, 5:45 p.m. in Libya] People in Tripoli are displaying files they say are from Moammar Gadhafi's compound, CNN's Sara Sidner reported Tuesday. The documents, files and receipts have the official regime stamp and Gadhafi's name on it, Sidner reported. "This neighborhood has gone wild," Sidner said. Sidner is being handed even more documents by the rebels. Rebels told Sidner they are going room-by-room to clear the compound. One of the documents is a medical file that has the name of Gadhafi's son Saif al-Islam, Sidner reported. [Updated 11:39 a.m. ET, 5:39 p.m. in Libya] Rebels are saying they have made it into Gadhafi's Bab Al Aziza compound, CNN's Sara Sidner reported. "They have been able to take some of the weapons off of the Gadhafi forces," she said. Rebels are telling Sidner "Gadhafi is nearly finished." Sidner said that rebels said they are still inside trying to secure the area, but are celebrating as fighting continues. “Now they’re going to try and clear the compound," Sidner said rebels told her. Sidner said that she is less than half a kilometer from the compound and can see more smoke coming from the area. Sidner said rebels are hugging each other and crying on the streets. Loud chants can be heard in the background. Rebels shouted "God is great, God is great" in celebration Tuesday. [Updated 11:32 a.m. ET, 5:32 p.m. in Libya] CNN's Sara Sidner, reporting from a neighborhood close to Gadhafi's Bab Al Aziza compound, said there are "massive blasts and lots of gunfire" in the area. "We have confirmed a civilian that has been hit by sniper fire according to a nurse" at the local clinic, Sidner reported. This is a dangerous place to be," she added. [Updated 11:23 a.m. ET, 5:23 p.m. in Libya] Al Jazeera is reporting that rebels have entered Gadhafi's residence within the compound in Tripoli. This is the area where intense fighting has been intensifying in the past few hours. [Updated 11:21 a.m. ET, 5:21 p.m. in Libya] CNN's Matthew Chance said that there are "ferocious gunfights" going on near the Rixos Hotel in Tripoli. The hotel is still firmly in the grips of Gadhafi loyalists, he said, adding that some windows have been smashed by sniper bullets and there has been incoming artillery fire. "From our perspective in here it’s been a real nightmare," he said. [Updated 11:19 a.m. ET, 5:19 p.m. in Libya] Libyan rebels have been seen firing celebratory shots into air inside Gadhafi compound in Tripoli, Reuters is reporting. CNN's Sara Sidner has confirmed rebels have breached the Eastern gate of Gadhafi's Bab Al Aziza compound. [Updated 11:10 a.m. ET, 5:10 p.m. in Libya] Urban warfare is in full force near Moammar Gadhafi's compound in Tripoli, CNN's Sara Sidner reported Tuesday. "This fight is on," she said, citing the sounds of artillery, blasts and gunfire. 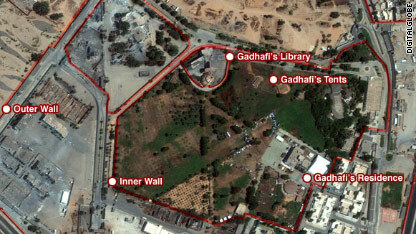 Sidner is close to the Gadhafi compound in Tripoli and reports that there are more large blasts occurring in the area. "We can actually hear the bullets flying past our head," Sidner said. Large black plumes of smoke could be seen over the compound. "Residents of Tripoli are definitely not safe," Sidner said. "People are ducking, people are tense. The situation is still an extreme one." Sidner said there were both incoming and outgoing fire. Sidner reporting the fighting appeared to be closer to where she was in Tripoli. She said she saw a woman with a bullet wound and shrapnel wounds near a local clinic. Sidner described seeing a 7-year-old boy, with a weapon larger than himself standing guard, outside a home in Tripoli. [Updated 11:09 a.m. ET, 5:09 p.m. in Libya] Iraq has recognized Libya's National Transitional Council "as the only legitimate representative of the Libyan people," the Iraqi Foreign Ministry said Tuesday. [Updated 10:48 a.m. ET, 4:48 p.m. in Libya] Moammar Gadhafi says he's "alive and well in Tripoli and not going to leave Libya," according to an Interfax report quoting the head of the World Chess Federation. Kirsan Ilyumzhinov told the Russian news agency on Tuesday he had a telephone conversation with Gadhafi and his son Mohammed. The information could not be independently confirmed. "Don't believe the mendacious reports by Western television companies," Ilyumzhinov quoted Gadhafi as saying. The official said Mohammed Gadhafi called him. They spoke and then Mohammed handed the phone to his father. [Updated 10:33 a.m. ET, 4:33 p.m. in Libya] CNN's Arwa Damon reports that actual shooting near the airport has died down, but she can now see smoke rising from an airport building in the distance. Damon asked someone with her what was on fire and he said it was the new airport terminal that had been under construction prior to recent events. Damon reports the rebels have secured “much of the area to the west” but don’t have the area to the east secured. The recent Gadhafi attack was two-pronged and came from the south and east, Damon reported, adding there are 2 military bases to the east from which they were coming. [Updated 10:17 a.m. ET, 4:17 p.m. in Libya] CNN's Matthew Chance who is at the Rixos Hotel in Tripoli said though he has a limited vantage point you can still hear exchanges of gunfire near the Gadhafi compound. "Clearly there is a huge battle underway between the rebels and the Gadhafi loyalists," he said. "That’s the situation as I see it at the moment from our limited vantage point." Chance pointed out that unlike other times, he is not hearing any NATO jets in the area. "We are hearing explosions," he said. "I assume they are an exchange of artillery shells." But Chance admitted that he's unable to see much and give a full view of the situation given the situation outside his hotel. "I'm lying on my belly in a hotel room hoping we don’t get hit by a shell," he added. [Updated 10:11 a.m. ET, 4:11 p.m. in Libya] CNN's Sara Sidner said that the mass exodus of people in Libya is continuing. “We have to wonder exactly what’s going on,” she said, noting that it's unclear why it's happening if rebels have achieved such large control over the capital. Sidner said residents are scared, fearful and unwilling to talk to reporters. She said you could see the emotion changing in their faces. “There is a lot of a tenseness in the residents that wasn’t actually there yesterday," Sidner reported. Sidner said she people are leaving in hoards. She even saw one person leaving in a car, despite having busted tires. Confusion about who is in control, mixed with fear is clearly getting to some residents, Sidner said. "There just isn’t anywhere that is actually safe” here right now," she added. [Updated 10:05 a.m. ET, 4:05 p.m. in Libya] CNN's Arwa Damon reports there is heavy gunfire near the Tripoli airport that rebels had previously taken over. Damon, who is on the tarmac, said there is a fresh battle over the airport between Gadhafi forces and rebels. She said rebels are trying to hold off incoming artillery fire from Gadhafi forces. The rebels have said they are "incredibly worried" that incoming artillery rounds could hit a plane and cause a "devastating explosion. So in response rebels are launching back their own attack. "This is the rebels literally unleashing everything that have around them," Damon said. Damon explain that the airport is a critical location because it is on a main highway that leads to the Gadhafi complex. That's why, Damon said, rebels have been "firing relentlessly” into the direction where they believe Gadhafi forces are launching the artillery attacks from. @sarasidnerCNN:"rebels now open and checking trunks"
@sarasidnerCNN: "Rebel check points security more strict. Nervous looks on residents faces streaming out of Tripoli." @sarasidnerCNN: "We've been hearing blasts and gun shots near airport in Tripoli"
[Updated 9:48 a.m. ET, 3:48 p.m. in Libya] Professor Abubaker Saad, a former aide and interpreter to Moammar Gadhafi, said although there have been a few recent setbacks in rebel advancements he knew this battle would be a struggle. "I thought it would be a struggle when the uprising took place in February," he told CNN. "He had ruled with an iron fist for four decades. When you are under fear for four decades its very difficult to come [out] from under it. So for me it’s a pleasant surprise. I was not planning to see it before I die." [Updated 9:29 a.m. ET, 3:29 p.m. in Libya] A helpful tool to get a better grasp of where fighting is happening in the capital courtesy of the BBC. Their interactive helps put the geography of Tripoli in perspective while providing video to show how intense the battles are in each area. The Guardian also provides a helpful map marking areas in Libya believed to be in rebel control versus those controlled by pro-Gadhafi forces. Their site also has a helpful map to keep track of tweets on the situation from reporters on the ground, experts and bloggers. [Updated 9:18 a.m. ET, 3:18p.m. in Libya] CNN's Sara Sidner is reporting from the ground in Tripoli that communication is difficult in the city, making it hard to really tell how much control rebels have over the city. But Sidner reports the battle is raging on all over Tripoli. "It is a street-to-street fight in the city," Sidner said. [Updated 9:17 a.m. ET, 3:17 p.m. in Libya] CNN's Matthew Chance is in the Rixos Hotel with other foreign journalists near the Gadhafi compound. He tweets: @mchancecnn: "Sniper took pot-shot at hotel & we all took cover. Journalists in #Rixos are fine, keeping together but have limited perspective on news." "In #Rixos huddled in basement of hotel. Incoming artillery fire in area around #Gadhafi compound." Minutes later Chance went to try to go back to his room and tweets: @mchancecnn: "Went back to room earlier & the door had been kicked in, things rifled through. Nothing stolen." [Updated 9:14 a.m. ET, 3:14 p.m. in Libya] Mahmoud Shammam, minister of information for the National Transitional Council, tells CNN that serious fighting is going on for the battle over Tripoli. "We are determined to surround them … and then take it,” he said of the Gadhafi compound. "We are going to get him. maybe today or maybe tomorrow. there is no way he can escape from us." [Updated 9:09 a.m. ET, 3:09 p.m. in Libya] CNN's Sara Sidner reports that residents are fleeing Tripoli in numbers she has not seen before. "It is very very dangerous in the capital right now," Sidner said. 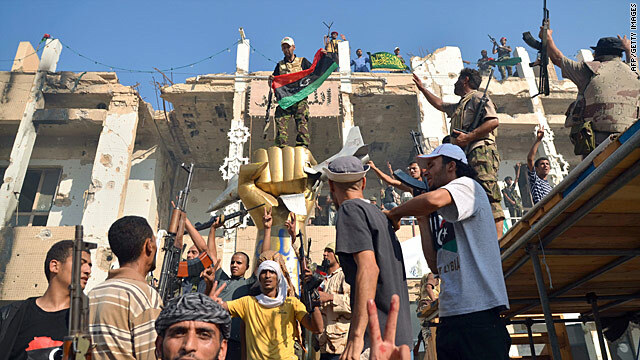 Renewed fighting and fresh battles continued around and near the Gadhafi compound in Tripoli. "There are no signs this is going to end any time soon," Sidner said as heavy fire and explosions could be heard in the background. Pictures of the skyline of Tripoli showed the compound with smoke billowing around it. [Updated 8:52 a.m. ET, 2:52 p.m. in Libya] Rebel fighters have surrounded Moammar Gadhafi's compound and managed to enter one of the gates, a rebel official told CNN. Mahmoud Shammam, minister of information for the National Transitional Council, said NATO has "hit some targets" in the compound as well. He said he estimates conservatively that rebels control 85% of Tripoli. He acknowledged that rebels had reported that Gadhafi's son, Saif al-Islam Gadhafi, was arrested, although Saif later turned out not to be in rebel custody. "We don't know if he was arrested and then escaped," Shammam said, adding, "We have to clarify." The National Transitional Council has established a small office on the outskirts of Tripoli, according to rebel sources. The location of the opposition office is not being disclosed but is in place to help facilitate a transition once Moammar Gadhafi is ousted. [Updated 8:50 a.m. ET, 2:50 p.m. in Libya] Rebel fighters have surrounded Moammar Gadhafi's compound and managed to enter one of the gates, a rebel official told CNN Tuesday. Mahmoud Shammam, minister of information for the National Transitional Council, said NATO has "hit some targets" in the compound as well. He said he estimates conservatively that rebels control 85% of Tripoli. He acknowledged that rebels had reported that Gadhafi's son, Saif al-Islam Gadhafi, was arrested, although Saif later resurfaced. [Updated 8:44 a.m. ET, 2:44 p.m. in Libya] "There will be no NATO troops on the ground (in Libya) in the future," NATO spokeswoman Oana Lungescu said Tuesday. [Updated 8:41 a.m. ET, 2:41 p.m. in Libya] The appearance of wanted Gadhafi son Saif al-Islam Gadhafi at a hotel "in the dead of night" doesn't reflect the government's power, but shows the "remnants of the regime are on the run," NATO spokeswoman Oana Lungescu said. On Monday, rebel leaders claimed they had captured three of Gadhafi's sons, including Saif - who is wanted on war crimes charges by the International Criminal Court. But Saif al-Islam, who had been considered his father's heir apparent, showed up at the Rixos Hotel on Tuesday, one of the remaining strongholds of pro-Gadhafi forces. [Updated 8:31 a.m. ET, 2:31 p.m. in Libya] NATO military spokesman Col. Roland Lavoie told reporters Tuesday he doesn't "have a clue" where Libyan leader Moammar Gadhafi is. "If you know, let me know," Lavoie said. He reiterated that Gadhafi is not a target of NATO, but the international coalition does target government command and control. He said resolution of this situation will be political and that Gadhafi is "not a key player anymore." There are are pockets of fighting in Libya's capital, but "Tripoli is not under Gadhafi control anymore," Lavoie said. [Updated 8:25 a.m. ET, 2:25 p.m. in Libya] Libya's opposition has assured NATO that it is respecting international law in its fight, and what the alliance is seeing on the ground reflects that, a NATO spokesman said. [Updated 8:13 a.m. ET, 2:13 p.m. in Libya] Vast numbers of areas are contested in Libya and the tensions are far from over, a NATO military spokesman said Tuesday. "Our mission is not over yet," NATO spokesman Col. Roland Lavoie said. "We continue to protect the civilian population" and enforce a no-fly zone. [Updated 8:10 a.m. ET, 2:10 p.m. in Libya] Carloads of people are streaming out of Tripoli toward Zawiya, a CNN crew said Tuesday. Also, Gadhafi regime forces are posing as rebels in Tripoli, rebel contacts told CNN. [Updated 8:03 a.m. ET, 2:03 p.m. in Libya] Rebels battled forces loyal to Libyan leader Moammar Gadhafi Tuesday north of Tripoli International Airport, along the main road into the capital. Heavy fighting could be heard, beginning shortly after noon, with frequent shelling and black smoke in the area. There are two military installations along the road. Rebels took control of the airport Monday. [Updated 7:48 a.m. ET, 1:48 p.m. in Libya] Nigeria, Africa's most populous nation, acknowledged "increased gains" by Libya's opposition on Tuesday and urged "the new leaders" to build a democracy. "Nigeria stands ready to work with the democratic forces in Libya in this transition process," the Foreign Affairs Ministry in Abuja said. Libya's Gadhafi regime long had been an influential power broker on the African continent. [Updated 7:41 a.m. ET, 1:41 p.m. in Libya] NATO jets were flying low over Moammar Gadhafi's Tripoli compound and a loud explosion was heard from inside the facility on Tuesday, the TV network Al Arabiya said, citing rebel sources. [Updated 7:15 a.m. ET, 1:15 p.m. in Libya] The Kingdom of Bahrain has recognized Libya's National Transitional Council as the country's "sole legitimate representative," Bahrain's state-run news agency reported on Tuesday. [Updated at 7:01 a.m. ET, 1:01 p.m. in Libya] Libyan leader Moammar Gadhafi's Bab al-Aziziya compound is under attack, a rebel spokesman and opposition fighters in Tripoli told CNN. [Updated at 6:56 a.m. ET, 12:56 p.m. in Libya] NATO air operations were continuing over Libya and its capital, Tripoli, on Tuesday to protect civilians in areas where pro-Gadhafi forces may be active, a senior NATO official said. [Updated at 6:28 a.m. ET, 12:28 p.m. in Libya] A spokesman for the International Criminal Court (ICC), Fadi El Abdallah, tells CNN it did not receive confirmation from the National Transitional Council that Saif al-Islam Gadhafi was in their custody. But he said the Libyan authorities and Moammar Gadhafi had an obligation to cooperate with the ICC. “If the suspects go to another state we will seek the cooperation of that state,” he said. [Updated at 6:12 a.m. ET, 12:12 p.m. in Libya] Al Jazeera reports that truckloads of armed rebel fighters have surrounded Libyan leader Moammar Gadhafi's Bab al Aziziya compound in Tripoli. [Updated at 5:36 a.m. ET, 11:36 a.m. in Libya] Explosions heard near Gadhafi's compound in Tripoli, according to the Al Arabiya Arabic-language news station. [Updated at 5:32 a.m. ET, 11:32 a.m. in Libya] A missile fired from Gadhafi's hometown of Sirte landed in the sea near the rebel-held city of Misrata Monday evening, NATO said Tuesday. The alliance said it had no reports of damage or injuries, but called the attack a "direct threat to innocent people." [Updated at 5:05 a.m. ET, 11:05 a.m. in Libya] A boat that was supposed to evacuate foreign nationals stranded in Tripoli Tuesday will be delayed, the International Organization for Migration said. The boat, which can carry 300 people, left the Libyan city of Benghazi Monday morning but the deteriorating security situation at Tripoli's port is causing delays, the organization said in a statement. [Updated at 4:31 a.m. ET, 10:31 a.m. in Libya] NATO confirmed Tuesday that it has been dropping leaflets in the area of Zawiya, Libya. One set of leaflets is intended to warn residents to stay away from military activities, NATO said in a statement to CNN. "The other leaflets were aimed at mercenaries fighting for (Gadhafi), encouraging them to give up the fight and to leave Libya." The leaflets are in Arabic and French. [Updated at 4:13 a.m. ET, 10:13 a.m. in Libya] News coming thick and fast now. British Prime Minister David Cameron made a series of calls to world leaders Monday, his office announced Tuesday. Cameron spoke with U.N. Secretary-General Ban Ki-moon; the crown prince of the United Arab Emirates, the Qatari prime minister, and the presidents of the United States and France. - Strong support for the important role of the National Transitional Council, including responding in a coordinated manner to any requests for assistance from the council once the conflict ends. [Updated at 4:07 a.m. ET, 10:07 a.m. in Libya] A NATO spokeswoman in Naples, Italy, has reported that one surface-to-surface missile was fired within Libya Tuesday, landing in the sea near the rebel-held city of Misrata. Earlier, NATO said three missiles had been fired. [Updated at 3:36 a.m. ET, 9:36 a.m. in Libya] Doctors in Tripoli are overwhelmed, and there are not enough medical supplies, the International Committee of the Red Cross has said. One clinic "has 40 beds, and all of the beds are taken. Some of the people have been treated or discharged and taken to other houses nearby in order to be treated," said the ICRC's Robin Waudo in Libya's capital. [Updated at 2:30 a.m. ET, 8:30 a.m. in Libya] New details on the battle for Tripoli according to an opposition supporter who spoke to CNN's Rosemary Church and Jonathan Mann. According to the opposition supporter, identified as "Ehab," the rebels set up sleeper cells in various neighborhoods across Tripoli. A "supervisor" was designated, who reported to a "commander." Ehab says the eastern side of Tripoli is under rebel control. And adds that among the areas still in regime control include the Rixos Hotel/Bab al-Aziziya compound and the Bouslim neighborhood – home of the notorious Bouslim prison and one of the poorest sections of Tripoli. When asked about who was in control of “Martyrs” Square, Ehab said that on Sunday/Monday, emotions overtook the fighters, so they rushed into the Square though they already knew that snipers were set up on rooftops of the buildings lining the square. The rebels retreated, Ehad said, because of snipers and because it is a high priority for the rebels is to keep all families inside their homes and safe. Ehad also told CNN that the opposition will not storm Gadhafi's Bab Al-Aziziya compound until NATO gives the go-ahead. "There should be some airstrikes as far as we know," he said. "We are hoping there will be a big bombardment in that area before." - Two of Gadhafi's sons, who had been reported captured over the weekend, were free early Tuesday. Saif al-Islam Gadhafi, who is wanted by the International Criminal Court on war crimes charges, spoke briefly to CNN at the Rixos Hotel, one of the remaining pro-Gadhafi bastions in Tripoli. - Mohammed Gadhafi escaped from rebel custody Monday, Libyan Ambassador Ali Suleiman Aujali told CNN. - There was no explanation from the National Transitional Council, the rebel leadership, which had announced the capture of both Gadhafi sons. - Renewed fighting could be heard around Zawiya, about 30 miles west of the capital. The town was a strategic stepping stone for the rebel advance into Tripoli over the weekend. - The situation in Libya "is still very fluid," U.S. President Barack Obama said Monday. "There remains a degree of uncertainty and there are still regime elements who pose a threat." - The U.S. State Department is "focused like a laser" on the issue of getting funding to the rebels' National Transitional Council, department spokeswoman Victoria Nuland said Monday. Nuland did not specify how much money could be provided, but said it would go toward "humanitarian needs" and "maintenance of essential services." - Several U.S. politicians called on Libyan officials to take action against Abdel Basset Ali Mohmed al-Megrahi, the convicted bomber of Pan Am Flight 103. Al-Megrahi was the only person convicted over the 1988 bombing of Pan Am Flight 103, which killed 270 people. He was released from a Scottish prison in 2009. - United Nations officials have not been able to contact Moammar Gadhafi, U.N. Secretary-General Ban Ki-moon told reporters Monday. "We've been trying to get in touch with him," Ban said, adding that he did not know Gadhafi's whereabouts. - Ban said he plans to hold an urgent high-level meeting this week to discuss the situation with several regional organizations, including the African Union, the League of Arab States and the European Union. - Libyan rebels have taken control of the country's state television network, Rebel TV reported. The Libyan state network was broadcasting a black screen. Are you serious that this is the location of Tripoli? Or you just gotta put all your targetted places together? Is it the hidden agenda?